This entry was posted in australian landscape photography and tagged australia, australian landscape photography, Australian Landscapes, australian seascape photograpy, Australian Seascapes, beach, cottesloe, cottesloe beach, Jamie Paterson, ocean, photo, seascape, water, western australia. Thanks Chloe. I just wish I could’ve jumped in the water. you didn’t drop everything after and have a swim? I really wish I could’ve but with all my camera gear on me it just wasn’t an option. Hey Jamie, it was nice and warm! Are you going to post the edited version? Arrrh Cott beach , my favorite place as far as beach’s go . 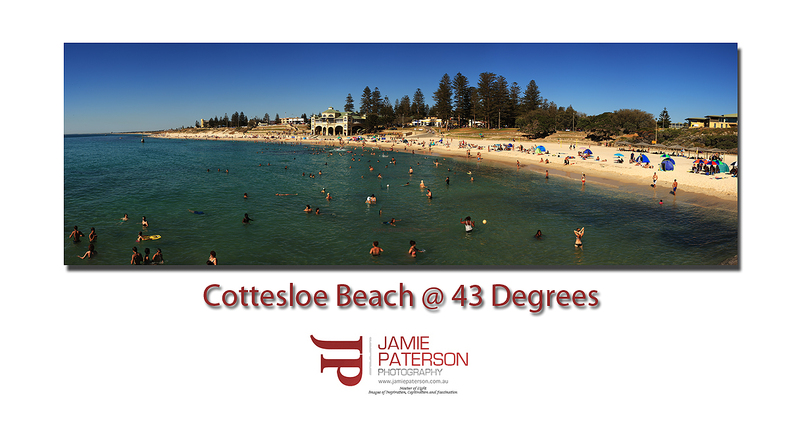 I think my favourite would be Coral Bay, but if we are just talking about Perth metro area then I’d settle for Cottesloe. Nice one Jamie..yeah it was hot eh! A lot of people at Freo this evening as well. Thanks for that mate. Maybe The West Australian will pick up this photo and use it. You never know your luck mate! I was out at 0430 this morning and got some gold! The hotter the Perth temps get the better it’s beaches look eh? Nice one, I think 43 is to hot for the beach, looks like theres quite alot of people there. I also noticed there are a few amputees in the water and some people that have managed to loos half their body. haha I know you havent processed it yet. Yeah 43 degrees was way too hot to be down there. I should’ve been at a bar somewhere with a Corona! What I love about Perth beaches is that even when they’re full there’se still plenty of space. Not like the beaches in England where full means literally no space on the sand as far as the eye can see. Makes me want to go back to Broome and have a beach all to myself. Thanks for that mate. You’re right about Perth beaches not being that packed. Try getting onto Bondi Beach on a hot day. Your tongue must’ve been hanging out Jamie (with the heat I mean). About time you got yourself an assistant to carry the gear, act as security guard, make sure the beer is cold – all that stuff! I’s a nice shot and conveys the atmosphere well. Trouble with assistants is that they either cost alot or they think they deserve the beer and dip in the ocean more than you do. Also nice tulip, like the composition, natural frame is very effective. when you edit this Jamie make sure you adjust your white balance there is too much yellow in it, that sand should be white. Also the water should be bluer, not Eagle Bay blue but a soert of dirty Perth blue. Ok that was a cheap shot at how our beaches in Dunsie are so much better!! Thank you very much for the advice. I will do so. I’m sure Esperance people say the same thing about Dunsborough beaches! I hope you and the rest of the crew have a great time onboard True North. I’ll talk to you when I get back!